What started as a personal challenge to de-clutter last December, turned into a yearlong quest to reduce clutter and create space for the things that matter most. It has been quite the year of sifting and shifting, moving and clearing. And I’m so grateful for those of you who joined me on this amazing journey. It provided such a boost knowing that you were all clearing, too, and it definitely kept me going when I wanted to give up. I’ve decided that I won’t be leading any Reduce Clutter; Create Space challenges for 2011, but clearing physical, emotional and mental junk will continue to be a big priority for me. I have such appreciation to each of who joined me in reducing clutter over the past 12 months. As we welcome the New Year, let’s continue our efforts to clear out the stuff and get to the essence – that place where we feel light and free. To wrap-up our Reduce Clutter; Create Space quest, it is with great excitement to introduce you to Sarah. She has been extremely consistent in her dedication to reduce clutter in her life and she joined me on this challenge from the very beginning. Her interview is authentic, compassionate, and extremely reflective, and I know you will find great inspiration as she shares her challenges and celebrations around clutter. 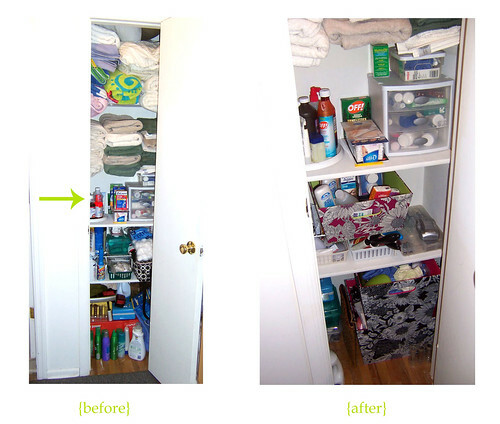 Why did you choose to join the Reduce Clutter; Create Space challenge for 2010? I joined so I could get kickin’ on the emotional/personal life clutter I have ignored for a while. I can be quite the emotional hoarder; the piles of stress, obligation, and feelings of inadequacy stack up and I ignore them. I keep charging forward without acknowledging the mess. 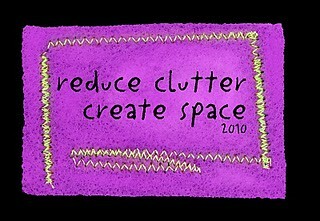 The Reduce Clutter; Create Space agenda was so attuned to my 2010 resolution to address what irritates me, what stresses me out, what I could stand to lose, and my goal to work toward a better me. Plus I had begun to successfully tackle physical clutter the previous year, so I was already motivated. Clutter is any thing, thought or feeling that weighs me down or holds me back. What kinds of reducing have you started this year? Over the past months, I’ve been working on the things that drive the emotional build-up, namely: guilt, perfectionist tendencies, motivation issues, anxiety, and fear of missed opportunity. And because I thrive on immediate gratifications, I have also continued to work on the physical end of things. It took me a while, but I started to realize my emotional clutter and my physical collecting tendencies were related. For a long time I’ve felt like I didn’t have the prerogative to make guilt-free choices, but as I work toward a positive self, it is getting easier for me to live life without the compulsion to dwell. I am creating room to relax. When I am working to reduce physical clutter. the results are very measurable and sometimes measurable accomplishments are just the push I need. My home is a space more reflective of my family; we are showcasing the things that matter and not just stuff we’ve picked up along the way. What has been the easiest part for you? Planning. 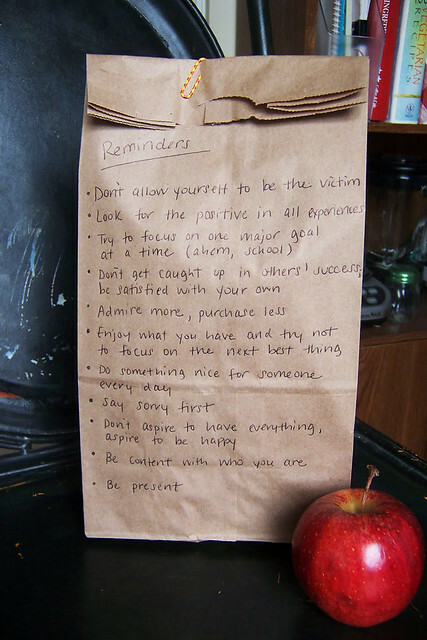 I am a list-a-holic and a preparation fanatic. I enjoy every moment of dreaming. The toughest was dealing with anxiety and finally working with a counselor who specializes in graduate school related stress. I previously thought asking for help meant I had failed. I also struggle to keep perspective. Situations are easily dramatized in my mind, and I can become obsessed with distracting projects. And my perfectionist tendencies are rather exhausting, too. Learning that it is not necessary to re-invent, re-perfect, re-evaluate choices I have made has taken time. This habit extends all the way down from school work to closet organization. 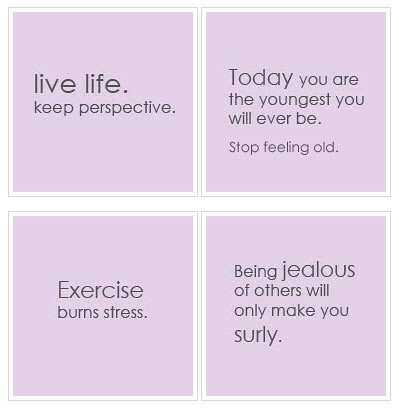 In my quest to maximize my life, I sometimes forget to live it. My most surprising encounter was when I realized I was overcompensating with my new found love for organizing/re-inventing. I tend to waiver between a case of “makeover syndrome” and “avoidance-driven chaos;” often dealing with anxiety by binge cleaning/overhauling/making over. When I’d freak out about an exam or looming work assignments, suddenly I’d have fifteen urgent home decorating or photo projects to attend to. I would ignore the piles of books and unwritten articles, and I’d feel guilty again. My guilt snowballed until I felt like a slacker, an idiot, a poser even. In crisis, I’d run to something manageable…an organization project, a quest for the perfect brown leggings, or a bedroom redesign. My “needs” and wants got blurred and my priorities turned upside down. What complicated it more was that I was using de-cluttering (a positive end) as an avoidance technique/stress deferrer (a negative means). Until recently, I wasn’t aware that I was delaying unsavory and uncertain situations with controlled and predictable activities. This is still an issue I am working on today. I also never imagined that my fear of missed opportunities (at all levels) was causing me to relentlessly seek “deals” and agree to every résumé building exercise that came my way. This became apparent to me when I scurried off to purchase a black “must have” blazer to complete my fall wardrobe. Guess what item still has the tag attached four months later? Opportunity searching has also allowed me to over-commit myself for fear of “missing out.” I am working to reassess my spending habits and the fear that drives me to compulsively capitalize on all prospects that I’m offered. I do not have to treat myself to everything I want or can afford, and saying “no” to jobs when my schedule is tight is not the end of the world. Do you have any tips, thoughts or suggestions to offer others who might be interested in reducing clutter to create more space in their lives? 1) Once you have acknowledged what is negatively impacting your life, keep yourself accountable; blog or journal about it, have a spouse or loved one check in, contemplate your habits and take note of what triggers your behaviors, and try to consciously retrain yourself. 2) Refuse Victimhood. In my case, I was feeling indecisive and conflicted about every choice I made, I was exhausted from setting the bar too high, and I felt defeated because I wasn’t getting the recognition I thought I deserved for my hard work. One evening I was having a good cry about it and I asked my husband how he deals with these situations and he said, “don’t let yourself be the victim.” That advice, above all, has been the easiest for me to follow. I have tried to pump myself up with mantras and face the rational me on many occasions, but somehow I never seem to really take myself seriously. But refusing to be the victim has been very empowering! Now when I have a Debbie Downer moment, when I don’t get credit for the work I’ve done, or others are hurtful or rude, I think about what I’ve gained from the experiences instead of focusing on how lousy I feel (even if I might genuinely be in a “victim” position). I am working to refuse being hurt by people or situations when it’s not necessary. As a result, pity parties have drastically decreased in my life. I think this process has helped me from projecting “intentions” onto others, speculating, and from holding grudges. 3) Don’t expect overnight results; this only sets you up for disappointment. I’ve done this to myself on many occasions and it’s painful. Some days I can tell guilt to kiss off and other days I am not as strong. It doesn’t mean that I have incurred a major setback (and thus more guilt); it just means I’m human. 4) Waiting takes the edge off of wanting. Admire more; purchase less. Will this journey continue for you into this next year? Now that we are in the holiday season, how do you stay grounded and keep from bringing more “stuff” into your life? I am really working on moderation, especially during the holidays. 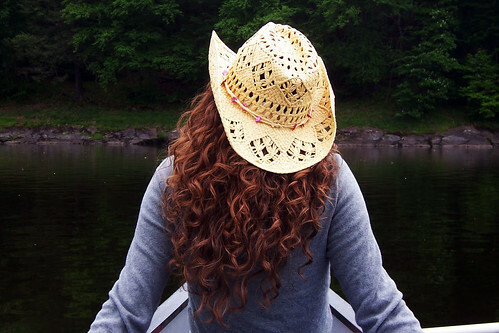 I’ll be avoiding certain websites and style blogs until my “needs” dissipate. My biggest holiday test will be in the relationship department though. Families can get into routines/roles, especially during the holidays. Past Christmases have been spent sulking over family encounters and worrying about what so and so did or said. This year I will work to break the cycle of assumption. I certainly don’t want to spend the car ride home boiling over “injustices” and hurt feelings. Quirks aside, family is about love.